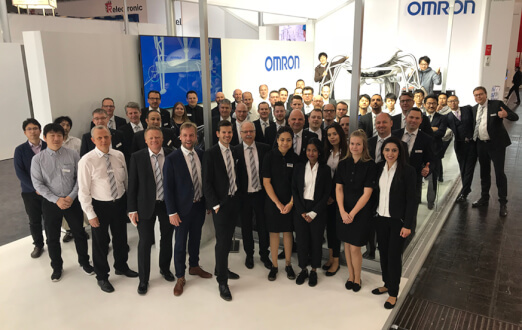 The OMRON booth was a hub of activity focusing on enabling manufacturing innovation and flexibility. We have summarized the highlights for you! Presenting our innovative-Automation! approach we focus on enabling innovation in manufacturing. This is underpinned by three pillars: ‘integrated’, ‘intelligent’ and ‘interactive’. Through seamless technology integration, and more intelligent use of data and harmonious interaction between humans and machines, the automation solutions are designed to help turn today’s production facilities into the factories of the future. Factories of the future need to be more flexible, and able to change production faster and produce shorter runs. The ultimate goal of flexible manufacturing is ‘Lot size 1’, to be able to deliver personalized products from an agile and connected production line. Innovative-Automation! provides synergy between our proven core competence in SENSING & CONTROL + THINK technologies, helping manufacturers achieve personalized products through flexible manufacturing while achieving higher OEE (Overall Equipment Efficiency), maximum safety and quality. 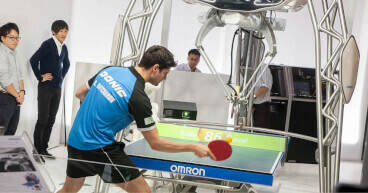 FORPHEUS, the 4th generation table tennis robot and tutor, showcased harmony between the machine and the human, table tennis champion Dimitrij Ovtcharov. FORPHEUS uses time-series deep learning AI technology and synchronous control to provide three new capabilities. It can now serve, predict shots like smashes and encourage players by reacting to the state of the game. A photo of Dimitrij and FORPHEUS was selected by MSN as photo of the day! For the first time, we offered a cockpit demonstration of our Driver Monitoring Sensor to see the future of autonomous driving. Did you know that a car can check your mental alertness and physical condition and act accordingly, ensuring safely and security? Thank you to all the visitors, staff and journalists!